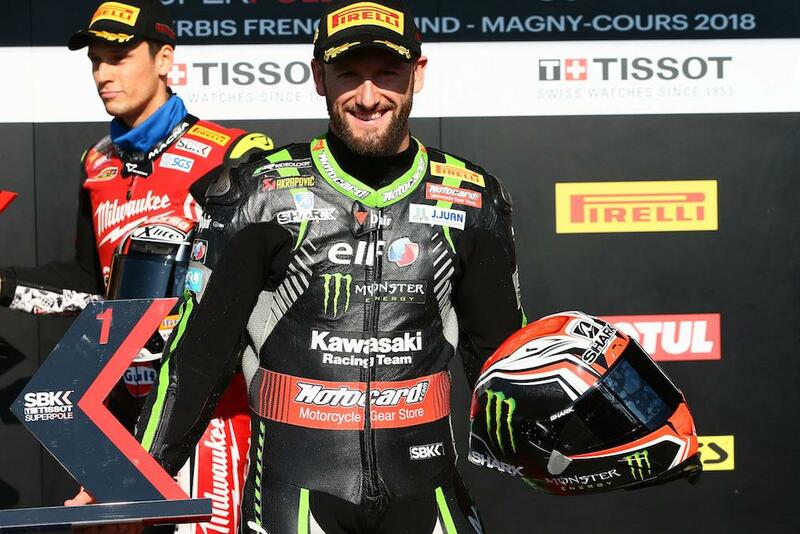 Tom Sykes denied team-mate Jonathan Rea pole position in a record-breaking Superpole at Magny Cours. 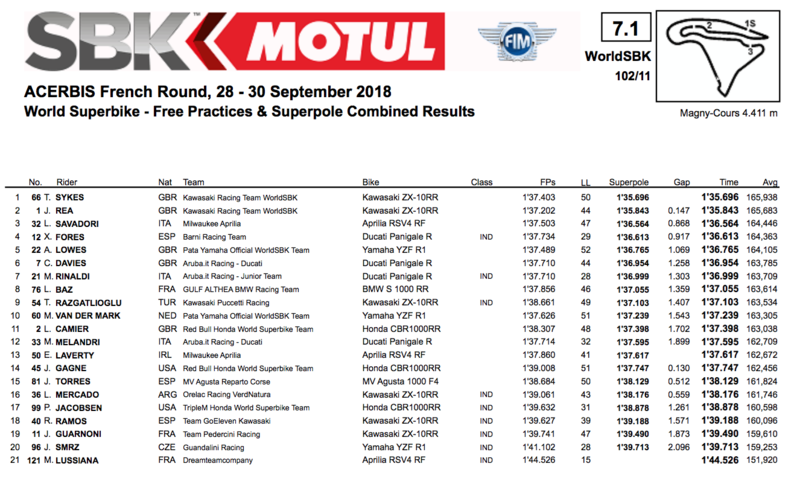 Champion-elect Rea had led the way for most of the Superpole 2 session when he blitzed his own time with a 1’35.843, shattering the circuit pole position record. But it wasn’t enough for Rea, with team-mate Sykes storming to a 47th career pole position, lapping 0.147 quicker than his team-mate ahead of his first chance to clinch the 2018 crown in this afternoon’s first race. Aprilia’s Lorenzo Savadori completes the front row, albeit almost a second behind the Kawasaki duo. Xavi Fores lines up as lead Ducati in fourth ahead of Alex Lowes with Chaz Davies completing the second row. Michael Rinaldi heads up row three ahead of Loris Baz with Toprak Razgatlioglu and Michael van der Mark rounding out the top ten. Leon Camier, who progressed from SP1, will start 11th as Honda’s woes continue while Marco Melandri endured a dismal session in 12th. Eugene Laverty will start just 13th after he was bumped out of a spot that would’ve seen him progress to SP2. Sitting atop of the times towards the end of SP1, the Irishman thought he’d done enough and was in the box at the end of the session but was knocked out by Leon Camier and Toprak Razgatlioglu. Race one kicks off at 12:00.